In a recent post and Indy column I presented evidence that younger workers have fared much better in the NL economic boom than older workers. The more I look at the data, the more amazed I get. 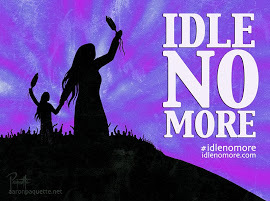 What is happening in NL today is in many ways unprecedented in recent Canadian history. For example, consider youth unemployment. 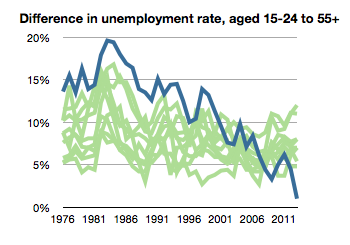 The unemployment rate for youth (aged 15-24) has always been high, because young people have little work experience and are trying to break into the workforce for the first time. Over the last 40 years, the youth unemployment rate in Canada has been 5% to 12% higher than the unemployment rate for people over 55. There has not been a single year in any province in which this difference has fallen to less than 2.5%. The following chart shows the difference in provincial unemployment rate between people aged 15-24 and people over 55. The blue line in Newfoundland and Labrador and every other province is green. During the 25 years from 1976 to 2000, NL had the largest difference in Canada. Today it is the lowest in Canada. In fact, the difference in the first half of 2013 is the lowest recorded in any province in 40 years! If this trend continues, the youth unemployment in NL will fall below that for people 55+ by next year, for the first time in recent Canadian history. 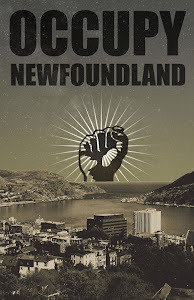 Occupy NL is a joke and you should be ashamed of yourself for being associated with it.